As I’ve mentioned before, flying is one of the times I am most anxious about the physical space I occupy. I have read so many horror stories about fat people being kicked off planes, that I keep waiting for it to happen to me one of these days. As a matter of fact, 2 years ago, when I first started going to therapy, a woman died because she couldn’t get back to her doctor after being kicked off a plane, because there was an apparent shortage of seatbelt extensions. Somehow I got caught up in internet comments about it and it sent me into quite the tailspin, but that’s a story for another day. When I have to travel for work, I go out of my way to get a flight with plenty of empty seats. I try to drive when I can, but 8 hours on the road in each direction is my limit. I also like to fly Southwest Airlines, because you pick your own seat and if I get an early enough boarding position, anybody who ends up sitting next to me made that choice. Sometimes all that diligence works out and sometimes I end up stuffed in a seat next to someone who is not thrilled to share his/her shoulder space with me. When that happens I spend the couple of flight hours twisted into the tightest knot I can manage, to avoid touching/reminding the person that they are stuck next to the fatty. So on Monday I had a SWA flight booked and as I normally do, I checked in at the counter to see if the flight was full. The lady told me it was a completely full flight, so I paid the $40 to upgrade to priority boarding, so at least I’d be sure to get an aisle seat (that way I can lean out, window seats you have no where to go and middle seats you’ve got two unhappy neighbors). I sat down to wait for the boarding announcements and get lined up, when the boarding agent, a big and tall guy named John, walked over to me and asked if I had just paid for an upgrade. I told him I had and he said I needed to go back to the ticket agent to have her fix my ticket. I didn’t know what the point of that was. She had stapled my upgraded boarding number to my previous boarding pass, so I figured maybe that needed to be different. When I got back to the ticket desk, the lady said she was refunding my upgrade fee and giving me another seat. She didn’t really explain what she was doing, but when she handed my papers back to me she told me to pre-board and handed me this slip (image below) to put on the seat next to me. The covered area includes my name, flight number and date and says it is not valid beyond the day of the flight. 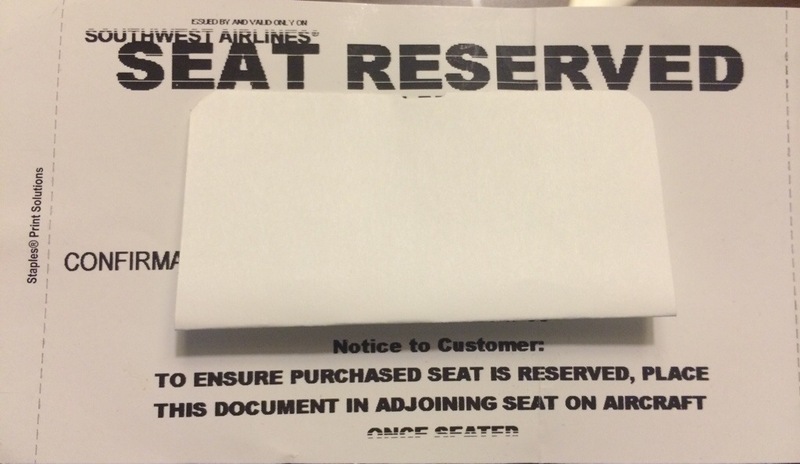 I had recently read something about Southwest’s Person of Size Policy, (sometimes called Customer of Size or Passenger of Size) but because I have to book travel through my company’s travel and expense website, I couldn’t book a second seat and since the agent had told me the flight was full, I didn’t ask about this mythical policy. I couldn’t quite believe the agents had gone to this length on a packed flight and I felt very awkward, like I was cutting in line, when it was actually time to board. The flight attendant immediately gave me the seatbelt extension I needed and the whole thing went off like it was the MOST NATURAL thing in the world. Later that day, I discovered when I went to check in 24 hours before my flight back home that they had booked me for an extra seat for that trip as well, which meant I couldn’t check in online. I didn’t know this was going to happen, and since getting an early boarding position is critical for my usual SWA seating strategy, it stressed me out. I called the number and they told me I had to go to the ticket counter to get my boarding pass, since I had two seats. When I got to the counter, the agent told me to go ahead and use the self serve screen. I quickly explained I couldn’t because of the extra seat and before I got half those words out he said “I got you,” hit a few keys and handed me my boarding pass and reserved pass (for the other seat). I was in awe at how thoroughly everyone was trained in regards to this newish policy. I work for a large company and know how elusive policy details and training can be. Once again, the flight was completely full, except for that extra seat of mine, and I got nervous as the last few people looked for seats, because you couldn’t see the reserved pass until you specifically targeted the empty seat. But the flight attendants helped people find seats and when pointing to empty spots said “that one’s reserved.” Once again, like it was just the most common thing that ever happened. One the one hand, I felt like it went a little too far in the “special treatment” direction. I was just glad not to be insulted or made to feel uncomfortable, so having everyone go out of their way was definitely new for me. But I also recognize that those extra “comforts,” like pre-boarding, avoid issues later, for example, if there are not two empty seats left next to each other and they have to ask people to move. I had to remind myself a few times that this was not a special accommodation for me personally, it is their policy, because it’s the right thing to do for their business. And once the surprise and newness of the process wore off, I felt nothing but deep gratitude for John, the gate agent, because I might have never mustered the nerve to request this “benefit” and for Southwest Airlines, because I never thought I would be able to describe the treatment I received ‘flying while fat’ as dignified. Unfortunately, SWA doesn’t always fly to or from where I need them to, but I will definitely choose them whenever I can and hope that other airlines will follow their lead some day. This entry was posted in Uncategorized and tagged COS, customer of size, dignity, fat, flying, gratitude, passenger of size, person of size, southwest airlines, travel. Bookmark the permalink. Thanks for sharing your story. Southwest is my favorite airline to fly.